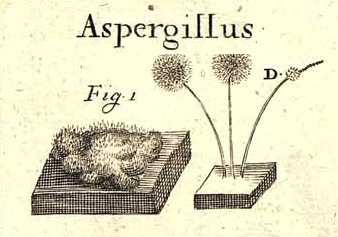 Micheli (1729) introduced the name Aspergillus, with Haller (1768) validating the genus and Fries (1832) sanctioning the generic name. Aspergillus glaucus (L.) Link is the generic type. In total, nine teleomorph genera were traditionally linked to Aspergillus anamorphs (Pitt et al. 2000), one of these being Eurotium Link: Fr. typified by Eurotium herbariorum (Wiggers: Fr.) Link. The others were Chaetosartorya Subram., Emericella Berk., Fennellia B.J. Wiley & E.G. Simmons, Hemicarpenteles A.K. Sarbhoy & Elphick (now considered to belong in Penicillium; Visagie et al. 2014a), Neosartorya Malloch & Cain, Petromyces Malloch & Cain, Sclerocleista Subram. (now considered distinct from Aspergillus; Houbraken & Samson 2011) and Stilbothamnium Henn. Neopetromyces Frisvad & Samson and Neocarpenteles Udagawa & Uchiy. were introduced more recently by Frisvad & Samson (2000) and Udagawa & Uchiyama (2002). Thom & Raper (1945) and Raper & Fennell (1965) published major monographic treatments on the genus Aspergillus and respectively accepted 89 and 150 species. They also disregarded teleomorphic names, contrary to the prevailing nomenclatural code, using only the name Aspergillus. The List of “Names in Current Use” (NCU) for the family Trichocomaceae (Pitt & Samson 1993) accepted 185 anamorphic Aspergillus names and 72 associated teleomorphic names. Pitt et al. (2000) updated this list, accepting 184 Aspergillus and 70 associated teleomorphic names. Both lists were mainly based on the morphological species concept current at that time. However, the move towards a polyphasic species concept incorporating morphology, extrolite data and most importantly phylogenetic data, meant that this list quickly became out-dated. This is not only because new species were described since the late 1990’s, but was also a reflection that many species previously considered synonyms based on morphology were shown to be phylogenetically distinct. Old names were thus often re-introduced as accepted, distinct species. Thom (1954) attempted to explicitly define species concepts used for Penicillium. He was the pioneer of standardised working techniques and emphasised that Penicillium taxonomy demands a consistent, logical approach. He demonstrated these tendencies himself by taking infraspecies variation when delineating species. To minimise infraspecies variation, the importance of standardised working techniques were again emphasised by Pitt (1979), Samson & Pitt (1985), Okuda (1994) and Okuda et al. (2000). Although this was relatively effective when dealing with freshly isolated or wild-type strains, comparing strains using only morphology requires experience and nuance, because of the degeneration of characters in old reference material and the large number of species in the genus. New techniques incorporated into taxonomic studies resulted in the physiological species concept (Ciegler et al. 1970, Pitt 1973, El-Banna et al. 1977, Frisvad 1981, Frisvad & Filtenborg 1983, Cruickshank & Pitt 1987a, b, Frisvad & Filtenborg 1989, Paterson et al. 1989), phylogenetic species concept, including Genealogical Concordance Phylogenetic Species Recognition (GCPSR) (LoBuglio et al. 1993, Berbee et al. 1995, Boysen et al. 1996, Geiser et al. 1998, Skouboe et al. 1999, O'Donnell et al. 1998, Peterson 2000a, Taylor et al. 2000) and eventually led to the combined approach using morphological, extrolite and genetic data in a polyphasic species concept (Christensen et al. 2000, Frisvad & Samson 2004). In the modern taxonomy, however, sequence data and GCPSR carries more weight than morphology or extrolite data. Even though Penicillium species are very common and the taxonomic structure of the genus is well defined, species identification is still problematic. Problems include an out-dated accepted species list and a lack of a verified, complete sequence database. On tis website we contribute towards a practical, stable, consistent, logical approach to Penicillium taxonomy, identification and nomenclature. Benjamin (1955) introduced the genus Talaromyces for teleomorphic Penicillium species with T. vermiculatus (P.A. Dang.) C.R. Benj. as generic type. The genus was characterised by soft ascocarps with a cleistothecial wall of interwoven hyphae and typically yellow ascomata, with ovate to globose asci containing mostly spiny ascospores (Benjamin 1955). Stolk & Samson (1971) introduced Hamigera for Talaromyces species that produce single asci, limiting Talaromyces to species producing asci in chains (Stolk & Samson 1972). Although Pitt (1980) considered Hamigera synonymous with Talaromyces, Houbraken & Samson (2011) showed that it is a distinct genus closely related to Warcupiella. Thermophillic Talaromyces species were shown to be distinct from Talaromyces (Houbraken & Samson 2011) and were classified in the new genus Rasamsonia and Thermomyces (Houbraken et al. 2012, 2014). 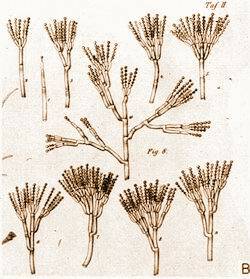 Talaromyces used to be associated with the anamorph genera Geosmithia, Merimbla, Paecilomyces and Penicillium (Pitt et al. 2000). Merimbla was shown to belong to a monophyletic clade with Hamigera, while both Geosmithia and Paecilomyces were shown to be polyphyletic (Houbraken & Samson 2011), with G. lavendula (generic type) belonging in the Hypocreales and P. variotii (generic type) monophyletic with Byssochlamys in the Thermoascaceae. 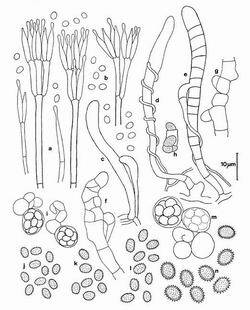 The remaining Geosmithia species belong in Penicillium, Talaromyces and Rasamsonia (Houbraken & Samson 2011). A number of species described as Talaromyces were shown not to belong in the genus. Three thermophilic species, T. byssochlamydoides, T. eburneus and T. emersonii, belong in the genus Rasamsonia and were renamed as R. byssochlamydoides, R. eburnea and R. emersonii (Houbraken et al. 2012). Talaromyces thermophilus is a biotechnologically important species and belongs to Thermomyces, with Houbraken et al. (2014) introducing the new combination Thermomyces dupontii for the species. Houbraken et al. (2012) showed that T. leycettanus belongs in the Hamigera/Warcupiella clade, and this species exact position within the clade should be further investigated. Talaromyces luteus morphologically resembles T. udagawae based on their ascospores having transverse to spiral ridges (Stolk & Samson 1972). Phylogenetically, however, T. luteus is basal to the Thermomyces dupontii and T. lanuginosus clade, and most probably represents a distinct genus (Houbraken et al. 2014). It was well documented that subgenus Biverticillium resulted in Penicillium being polyphyletic (Frisvad et al. 1990a, Frisvad et al. 1990b, LoBuglio et al. 1993, Berbee et al. 1995, Ogawa et al. 1997, Ogawa & Sugiyama 2000, Peterson 2000, Heredia et al. 2001, Seifert et al. 2004, Wang & Zhuang 2007). Houbraken & Samson (2011), using a four-gene phylogeny, showed that Penicillium subgenus Biverticillium and Talaromyces species form a monophyletic clade, with Samson et al. (2011) recombining these Penicillia into Talaromyces in support of single-name nomenclature (McNeill et al. 2012).